A rich and creamy Mango Sorbet recipe that is refreshing, delicious and healthy. It makes a perfect popsicle too! I am mango crazy. I told my husband that I wanted to move so I could have a mango tree. Of course he thinks I’m nuts, even though he does benefit from my mango obsession. This obsession forced me to by a flat of 6 mangos. What does two people do with 6 mangos? Lots of things, like Mango Sorbet! 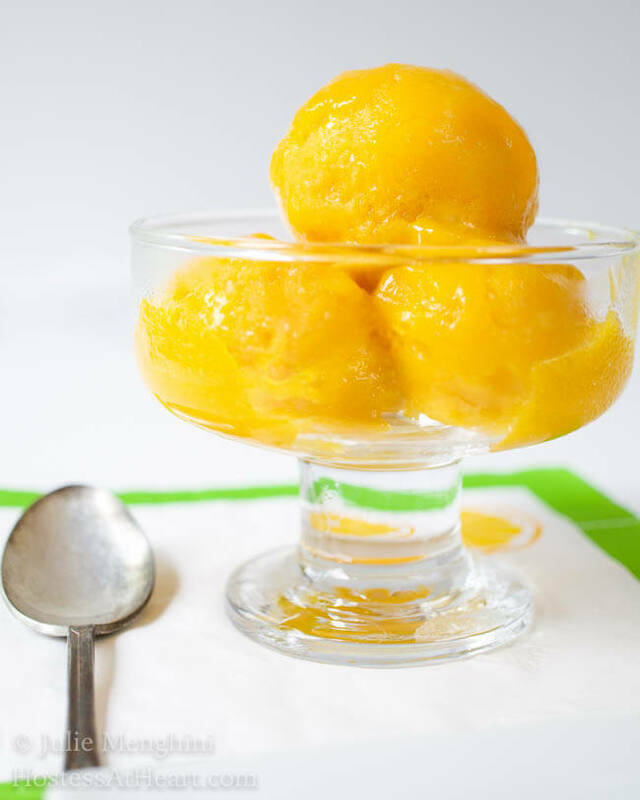 Last month, Tracy from Served From Scratch posted a 4 ingredient Peach Sorbet recipe. It looked just delicious. I had my last two mangos sitting in a basket threatening to perish. I knew that these last two mangos would make some mighty fine Sorbet, which was perfect for this hot weather stretch we’ve had. I had to make some changes to Tracy’s recipe, but she was my inspiration! This sorbet freezes hard and would make a great popsicle or a yummy slushy once thawed a bit. You will want to remove it from the freezer about 15 minutes prior to serving so you can scoop it. Or, you can just eat it right out of the blender when no one is looking. I have no idea where that thought came from. Line a freezable dish with plastic wrap. I used a loaf pan. Put all ingredients into a blender or food processor. Blend until smooth and creamy. Pour into freezer container and freeze. Remove from freezer 15 minutes prior to serving. Now this is the perfect dish to take to Fiesta Friday, Saucy Saturday, or at any gathering you are planning! Thank you! I can’t get enough of this stuff, and I can have a couple scoops without any guilt or sugar cravings. Please let me know what you think. I appreciate your wonderful comment. This looks so refreshing for a hot summer day! Thank you! It was just as good as ice cream. I was so happy that it came out so yummy. Enjoy the rest of your weekend! Wow, this looks so pretty and refreshing! I love mango (although have a hard time getting ripe ones here). If I can get some, I would love to try it. Pinning! Thank you Shari! Those mangos can sit out for quite a while before they get ripe. Thank you Chitra! It’s easy and yummy! How delicious and refreshing for the summer. This looks amazing! Thank you so much Amanda! I’ve had a great response to this recipe, and so far all thumbs up! Thank you for stopping by! This sorbet looks so good, Julie! I need to try it! Super easy Nancy! And it is just as delicious as a full fat ice cream in my opinion. Enjoy your weekend! Looks delicious! My house is filled with mango smell as a whole batch is ripening. It is a lovely smell and I am including them in many dishes. This is a lovely sorbet recipe to try! Thank you! You are very lucky to have access to a whole batch of mango! I am sure it smells wonderful! This is an easy recipe, and I will be making it again soon. Yummm! Sometimes I blend up frozen mango with Greek yogurt for a “fake froyo” that I can eat for breakfast, haha. I love mangos! Wonderful idea Liz! Probably healthier than putting them in a margarita? Just look at the lovely vibrant color. We are a family of Mango lovers. 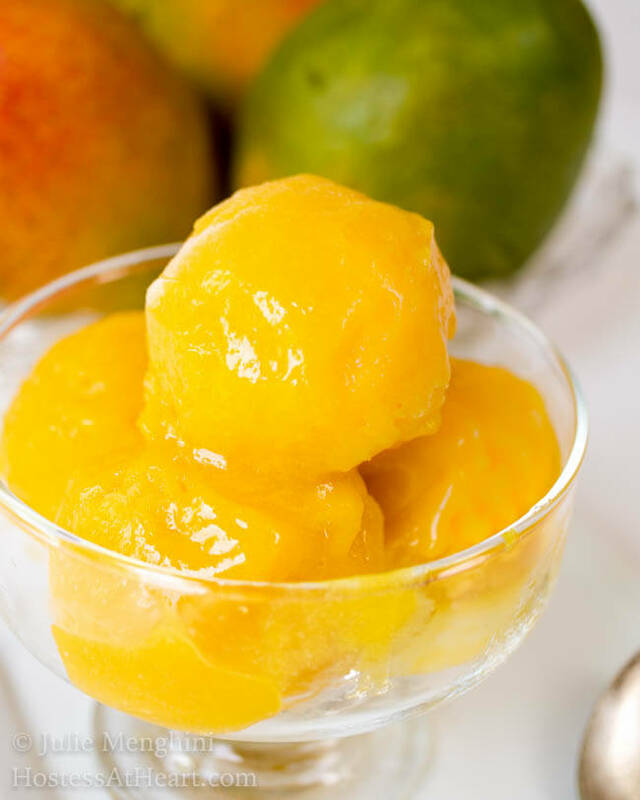 We had three Mango trees in our family home and the pleasure of watching them from the flowering stage till the ripening of the fruit is something in its own.Nice sorbet recipe. Thank you skd! My son moved to Florida and has mango trees. He may be removing one because the mangos fall in his pool. I could just knock him in the head. I’d be bobbing for those mangos! Silly boy. You are smarter than I! I’m wet and you are ready to eat mangos already! I need a keeper. Oh that would be John. Have a wonderful weekend skd. I always love chatting with you! They also make a great margarita Dawn! Cheers. Thank you Freda! I didn’t even know there were different kinds of mangos! I’m going to have to head to google now! There are tastier mangos? I can’t even fathom that Freda! I must search them out and try them. We could just have a virtual farm! I also need your chickens and an avocado farm. However, moving to Italy we could have it all and tons of beautiful lemons! I say a caravan to Italy is the way to go! I agree!! 🙂 And Italy will be perfect for my husband’s vineyard and olive grove! Ciao, Italy!! And wine! Yes he can come too. Thank you Tracy! Your peach version was gorgeous and I couldn’t wait to try it. This looks so refreshing! Perfect for these hot summer days down south! Great recipe! Thank you so much! Easy and refreshing. That looks amazing and it is so quick and easy to make! Thank you! It is Ana! My favorite way is to just put it in a cup and eat it on the patio. Now I need that Mango tree (and an avocado tree)! Thank you Jenny! It sure doesn’t take any time, and tastes like the fattier stuff. Enjoy your day! The color is so vibrant it’s like a bowl of sunshine. I love mango this sounds wonderful. Thank you Suzanne! It was so quick and easy and was yummy even before freezing.